The New America Foundation is getting heat from pro-Israel commentators over its upcoming event promoting a book that likens Israel to Nazi Germany. 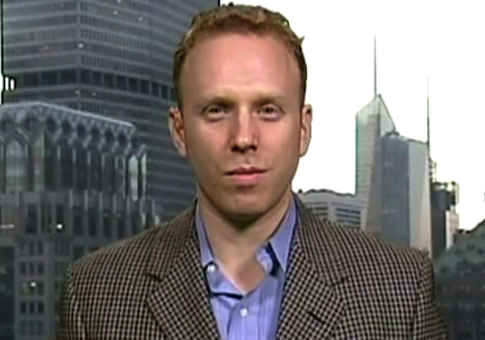 The prominent liberal think tank is hosting a Dec. 4 book discussion for Goliath, written by anti-Zionist activist Max Blumenthal. The book accuses Israel of fascism and includes chapter titles comparing the Jewish state to the Nazi regime, including "The Concentration Camp" and "The Night of Broken Glass." The controversial tome has drawn criticism from progressives. Nation columnist Eric Alterman, who wrote that it "could have been published by the Hamas Book-of-the-Month Club (if it existed)." Pro-Israel Democrat Alan Dershowitz recently blasted the book, calling Blumenthal "an extremist bigot whose greatest appeal is to anti-Semites and others who apply a double standard to the Jewish state." However, Goliath did however receive an enthusiastic endorsement from white supremacist David Duke's website, which called it "extremely valuable" and said it "verifies points that Dr. Duke has frequently made." The invitation for the NAF event describes the book as "an unflinching, unprecedented work of journalism which depicts a startling portrait of Israeli society under siege from increasingly authoritarian politics." The event will feature Blumenthal and NAF national security program director Peter Bergen. Bergen, a journalist who has written extensively about al Qaeda, did not respond to request for comment. Pro-Israel commentators expressed outrage that NAF was providing a platform for Blumenthal’s work. "For those who still believe that the advocates of American liberalism are honest and have decent principles to uphold, the decision to publicize this vile book by an out-and-out hater of Israel should be eye-opening," wrote historian Ron Radosh. Commentary’s Jonathan Tobin wrote that "by choosing to associate their institution with a book that smears Israelis as Nazis and calls for its destruction, the NAF has crossed a line that no decent individual or group should even approach." "Just as it would be a scandal if some conservative think tank of comparable stature hosted an author of an openly racist book or one advocating the virtues of slavery, there is something shocking and fundamentally indecent about NAF’s decision to host a writer who is the moral equivalent of the Ku Klux Klan’s David Duke," Tobin wrote. NAF receives funding from the U.S. Department of State, as well as Microsoft Corporation, Facebook, and T-Mobile USA. It also receives funding from Jewish organizations, such as the Jewish Communal Fund and the Jewish Community Foundation of Greater Phoenix. NAF is run by its president and CEO Anne-Marie Slaughter. Slaughter did not respond to request for comment. The Free Beacon reported earlier this month that Blumenthal’s father, top Clinton confidante Sidney Blumenthal, hosted a book party for Goliath.